Find hotel near Palacio Museu Olimpio Cam .. 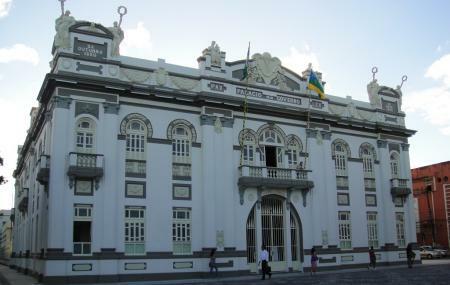 Built in 1863, this beautiful neo-classical building was the seat of Sergipe state’s government till 1995. Early in the 20th century, some serious redecoration introduced contemporary European influences in its look. Though it was made into a museum of sorts in 2010, and opened to the public, it can still only be visited via guided tour. The guides will take you through rooms filled with 19th century furniture and decoration; photographic exhibitions and panels of how the city used to look like in the past; the governor’s room, the dining room, and the office; a library; an art gallery and museum space showcasing paintings and historical artefacts; and the archive. Check out the cafeteria and the bookstore. How popular is Palacio Museu Olimpio Campos? People normally club together Museu Da Gente Sergipana and Parque Da Cidade while planning their visit to Palacio Museu Olimpio Campos. Muito arrumado, organizado e com custo zero para o visitante. Uma lição muito bonita da história de Aracajú. Não perca a visita guiada! Palácio bonito e bastante preservado. Vale a pena fazer a visita guiada e gratuita que mostra os ambientes e suas funções na época em que funcionava como sede do governo. Tem também uma maquete enorme da cidade de Aracaju que achei muito interessante. Enquanto explica alguns dos principais locais do centro histórico, a guia aperta um botão que acende a réplica de alguns desses prédios para identificação.